I like hamburgers and I like retail so hamburger retailing is something that interests me. :) And I think Grill'd have absolutely nailed the entire fast food hamburger retailing experience from start to finish. Grill'd for those who haven't seen it is a chain of fast food hamburger restaurants in Australia. Launched by Simon Crowe in Melbourne in 2004, they've relatively recently franchised and quickly expanded their chain of burger bars. They offer 24 different burgers and 4 salads ranging in price from around $7.90 to 14.90. The burgers are cooked to order and are generally ready in about 5-7 minutes. 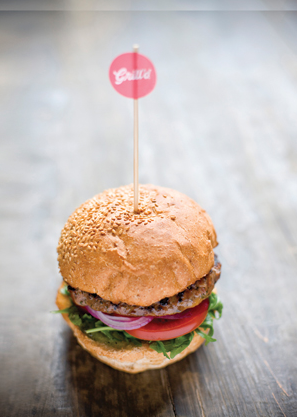 Grill'd pitch themselves as a healthy eating option with fresh ingredients and low fat patties. The burgers are amazing, up there with the best I've ever had anywhere in the world. The ingredients look and taste incredibly fresh, and they even only use the dark green pieces of lettuce, something which I've always thought makes a burger look much better. (I assume they only buy the darker parts of the lettuce from their suppliers rather than throwing out the whiter parts). The kitchens are in the open, you can see your burger being cooked, the people cooking it and you can see how clean they keep the kitchen. The restaurants have lots of seating and a higher end fitout with lots of wooden panelling and nice looking chairs. My local Grill'd on Crown St. in Darlinghurst has bar style seating opening out onto the street and even has a great selection of magazines and newspapers you can read while you wait for and eat your burger. The staff are incredibly friendly and look like they're having fun at work. They always have something friendly and nice to say whether it's about the weather, events happening in Sydney or something you're wearing. I went to Grill'd on Australia day with family and the staff were all dressed up with Australian flag bandanas and tattoos and they even gave us an Australian flag to put on our 2 year old cousin's pram. Happy, friendly, outgoing staff is not an easy thing to achieve, particularly with a franchised chain but they clearly select and train their franchisees well and those franchisees then do a great job of building a strong, vibrant culture within their stores. Their marketing is excellent. The burgers are wrapped and packaged beautifully and they include a little booklet all about Grill'd with takeaway orders. They're active on Foursquare, you get a free small chips with any burger purchase by checking in and the mayor gets a free burger on Friday. During Movember, anyone sporting a Mo got a free burger at certain hours on Fridays. The fries are delicious. They're thick, they use chunky looking salt and add some tasty fresh herbs - oregano and thyme is my guess. They also have 3 delicious sauce options. If you don't eat your free Foursquare fries and choose juice as a drink then I think the Grill'd claim for being a healthy eating option is probably quite reasonable. My favourite burger is actually 'Garden Goodness', a vegetarian burger which seems to fit the healthy bill. My previous favourite burger chain in the world was In 'N Out Burger in the US which I still love, but I think Grill'd beats it. My previous favourite burger chain in Australia was Oporto but after about 10 Grill'd outings I decided to go back to one of their stores the other day and the whole experience was worlds apart from Grill'd. Everything from the tired store fitout, the uninterested staff and even the burgers which I thought I loved just weren't up to the same standard as Grill'd. Hats off to the Grill'd team for building a fantastic hamburger retailing business. I agree Foxy... The whole value equation stacks up brilliantly (food quality, flavour, store experience, service, all at a good price). They're blitzing the competition. That said, if you do have a couple of extra dollars in your pocket, and you're in Sydney, the burger at Rockpool Bar and Grill is $22 and will be THE best burger you will ever eat. And in terms of other fast food concepts, I quite like Guzman and Gomez (mexican). Again, quality food, great flavours, great in-store experience, great service at a good price. I loved Grill'd too (I eat their burgers about 2-3 times every two weeks) but the salads on their menu are below standard in my opinion. I can see the reason why they diversified their menu to include salads (they didn't originally as far as I can remember) but unfortunately they have not pulled it off. Understandable of course, because the fundamentals of making good burgers are hard to translate into making a good salad. As far as I can tell, the salad leaves are the same as those used in the burger, same with the chicken breast, as are the cheeses, and the seasoning on their garlic bread is remarkably similar to that used for their chips and is not a great fit. Also, the fact that the burgers and chips are so good almost makes me want to (maybe unfairly) experience the same level of satisfaction with their salads. Also, I had a really weird customer service moment with them at their Fortitude Valley store in Brisbane. I wanted to order a normal burger AND the kids option called the "mini-me pack" for $7.90 and the lady at the counter refused to sell it to me because I am, despite being quite short, not a kid! I thought this was hilarious and after initially inquiring as to whether she was joking she informed me that she was being serious. This makes no sense to me. If the aim was to force me to buy two burgers, I wouldn't do that because it is too expensive. I didn't want to eat chips because they are fattening so it seemed logical to order a children's meal. Also, the salads are too expensive to be eaten as a side. So in the end they missed out on 8 dollars or so and irritated me because I couldn't satisfy my hunger. This I think is the crucial oversight, if you buy just a burger at Grill'd for dinner, and don't want to eat an unhealthy side or fork out for another whole meal (either another burger or a salad), you will be unsatisfied if you have a decent appetite. In my view, this is a gap in their menu. Otherwise, a big fan like you! And I should say that I have also had AMAZING customer service experiences with them - mainly at their newly opened store in the CBD in Brisbane. my friends rave about Grill'd all the time! So I had to try it. They also give out a lot of coupons (buy one get one free) which keeps them coming back. Lastly, I think having happy and energetic staff do make a huge difference to the atmosphere and to the customer. Yesterday, I was at Wholefoods in Austin, Texas and I saw one of the staff giving another staff member a shoulder massage whilst waiting behind the food counter for customers and she said "this is why I love working here!" aloud to the customers going past. I couldn't help but smile and so did the people around me, and I thought this is one of the reasons I do my grocery shopping here.